Thanks Dave for this album. I've been looking for this LP since I wasn't getting it on Ebay, because I don't have a PayPal account, but I don't need it. 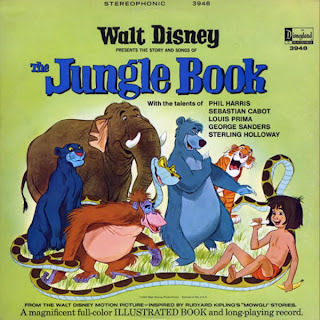 "The Jungle Book" was a great film as well as the story LP. Last year, I got the Platinum Edition DVD of "The Jungle Book" and it was splendid. The audio quality was excellent without the record, because of the ticks and pops wasn't being heard. Glad I could help, and thanks again to steve for sending me all of his great collection. Dave, I know it was a long time ago, but is there any chance you could re-up this LP, or give me a link? In any case, thanks for a fascinating blog! Dave - further to my post a moment ago - I was after the version narrated by Alan Smithee and have found it on YouTube. So no need to go to that trouble. Thanks anyway!